Claudia Hutchinson (Certified Nutrition Practitioner), spoke to our group on Tuesday, July 29th at the brick workout and gave us all a great deal to think about when it comes to what we put in our bodies. What we eat can help us train harder, longer, faster, but most importantly, it can help us heal and recover from injury. To keep your Immune System strong eat lots of colourful fruit & vegetables!!! Inflammation must be managed, remember it is increase blood flow to the injured area that brings lots of healing properties, so don’t squash it completely. Good fats are anti-inflammatory and bad fats (trans and animal) are pro-inflammatory. Aim to eat a little more protein but not all at one meal, spread your intake throughout the day so you are constantly sending it to the injured area so it can do it’s work and repair. An example would be to eat a couple of eggs or protein smoothie at breakfast, salmon or tuna on a big salad for lunch, and a stir fry with chicken or organic tofu for dinner. Eat enough calories so you can heal, we often cut back when training volume is reduced, be careful not to cut back too much. Eat at regular intervals throughout the day. The goal is to continually supply nutrients to the body and the injured area so it can heal 24/7! Stay hydrated, water plays a very important role in the healing process. Cottage country – it calls you to swim, bike and run. If you are lucky enough to spend some time in our beautiful north, you will agree that there is nothing like an early morning swim in a clear lake, a mostly car-free bike ride along a shaded rolling road and run thru a pine tree scented trail. Ahh, the cottage…. So what better place to do your own race. Especially if the official one got rained out (or you were too chicken to participate). Darin Graham did just that, and his story is quintessential cottage……….. I had hoped to do the Sprint Tri at Gravenhurst on Sunday, but alas the weather didn’t cooperate. None the less, it was a fun day with a little story behind it that I’d like to share. I had gone up to my wife (Jane) sister’s cottage on Lake Muskoka with Jane, her sisters and their husbands to stay just outside of Gravenhurst for the weekend. We did it for the race last year and it worked out well. But on Sunday night it was raining really hard, and when I got up at 5:30am the wind was howling, the waves high and the rain belting down. At 7am it had settled a bit, but barely with high waves and solid rain…and now thunderstorms predicted for 9-11 am right during the race. I don’t like biking in rain as its too slippery for chicken me, so back to bed and wait for the next race. We did get out to the race to see the die hards in action. We arrived just as the first group was coming out of the water. Like the rest of the crowd protected by our umbrellas, we cheered them on. I didn’t see anyone I recognized but hoped the best for everyone. Although the bay was sheltered and the waves not too bad for the swim, the rain picked up just as the bike portion started and the transition zone was filled with muddy puddles. Maybe they had turned the event into a Mudder and didn’t tell anyone. After everyone was off on the bike we decided to leave because the rain was just not welcoming. I was a little depressed not having raced that morning, but knowing that I had made a good choice for me. In the early afternoon the wind died down a little, the waves weren’t too bad on the open lake, the rain had stopped and the sun was trying to come out. My bike was standing beside the cottage and my tri gear all ready to go…both them and myself sad because we didn’t get out. 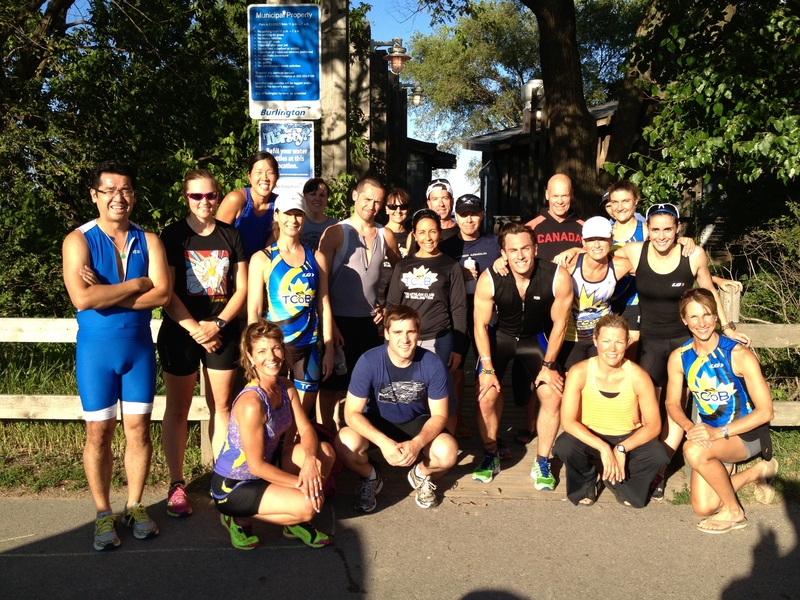 So, I decided to do the first annual Alternative Gravenhurst Tri. Jane got in the kayak as the safety boat and my brother in law John (who is a good swimmer) and I started out across Lake Muskoka for the 750m swim. John turned back after 100m as it was too cold, but I pushed on through the waves. It was my first time in waves of any sort (about 1 foot from peak to trough) but I touched the goal point and returned back against the wind and waves. It felt good as I came out of the water…thanks to some open water training with Beth at Gulliver’s. I had used the front porch of the cottage as the transition zone and the family were waiting there cheering me on and taking pictures. I got on my bike and off I went. They had just paved some gravel roads around the cottage area that now made a good loop for biking. Steve and Maggie (sister and brother in law who own the cottage) wanted to know how big the loop was for biking themselves. It was very hilly…much more hilly than the actual Gravenhurst Tri. The loop was only about 18km so I did some extra to make up the required distance. On my return at the end of the driveway everyone was cheering and making noise with the clappers. In the transition, Steve and Maggie were waiting in their running gear. Both of them run but hadn’t been out in a month or so and thought it would a great time to get a run in. All three of us headed out to tackle the 5km loop of gravel and paved roads that they use for their typical morning run. Steve is a solid fast runner so I had to push it to keep up with him on the hills. Before I knew it I was back at the finish line with the crowds cheering me on. And I had come in 1st place!!! 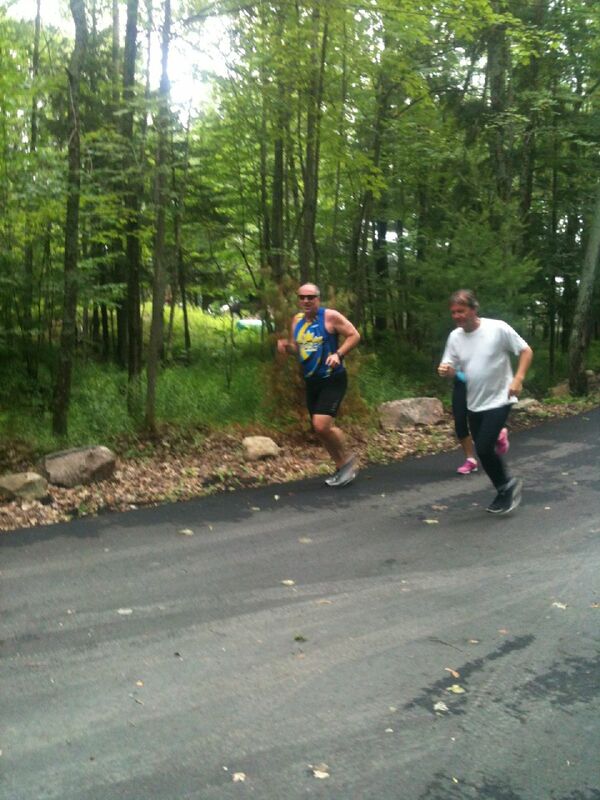 It was more hilly than the Gravenhurst Tri I did last year and I guess I shaved about 10min off of that time. The whole family got involved and it was a great way to spend the afternoon after a very dreary and disappointing morning. The race may not be official but it certainly was fun for everyone. Matt Robertson – winner of the first Splash and Dash. By Ana Lemus: Wow! That was cool! Like, literally!!! The water temp is low and we still managed to get some crazies in the lake for our first SPLASH and DASH!! on Wednesday July 9th. CONGRATULATIONS to Matt, Tanya, and Eric for winning 1st, 2nd and 3rd! Great workout to all ! We are amazed at your bravery and great sportsmanship!!! Join for the next one (hopefully for a little longer swim if the water temperature co-operates) on Wednesday Aug. 6th. But believe me it is a fabulous race venue with a lake the colour of a (well kept) backyard swimming pool, some incredible vistas on the bike and a wickedly spectator friendly run route (that is just crazy flat). On race morning we were greeted to a full-on double rainbow, so full you could practically see the pot of gold at each end, plus the race site was out of the rain, how great is that? 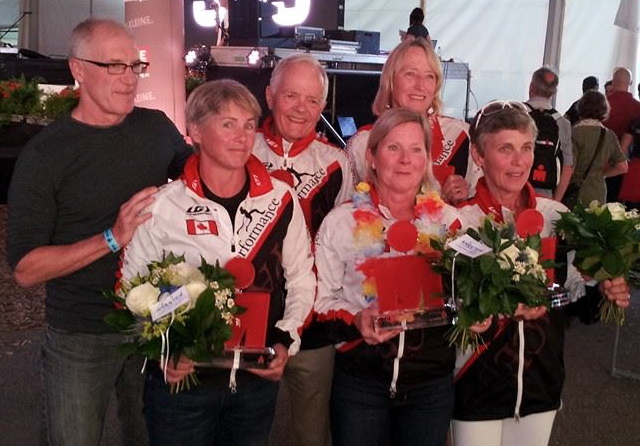 Our team of PACEperformance racers and cheer squad may not have been the biggest but we were certainly noticed! 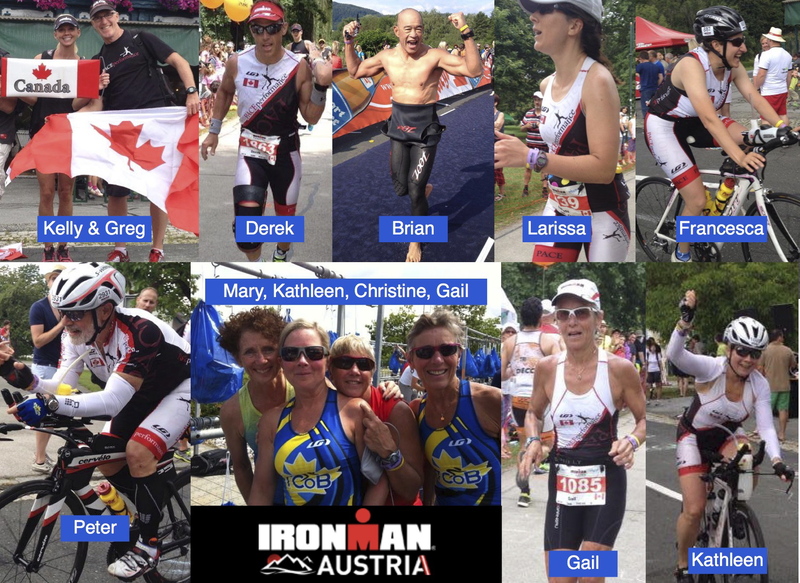 Racers included IronVirgins Francesca Ricci, Brian Carr, IronVets Kathleen Robb, Chris Walsh, Peter Cook, Derek Rivers, Larissa Robinson and Gailio Burgess! I could relate to you the significance of this race for each of our TCoB/PACE team members, but instead please ask them individually about their race. I thought I might just relate to you some vignette stories from our experience on the day. The swim goes out and around the lake for 2.8k and then down a 20 foot wide canal for the last Km, so every time the swimmers would take a breath they would see spectators 3 deep on each bank yelling and waving. We had stationed ourselves 150m on the dry side of the swim exit – a perfect vantage point to wave our Canada flags and see our guys exit. Derek Rivers lead out of the water (and in fact lead our entire team all day long!) although Francesca was clearly the happiest of all 3000 participants to be on dry land – followed by B (i.e. Brian Carr). Just as B exited the swim we heard the bike race announcer say “Peter, your front tire is flat”, as a coach I heard this and thought, nah it can’t happen twice, and there are a ton of Peter’s in the race! But then … “Peter from Canada your front tire is flat”, (and it did happen twice – the first time was in Lake Placid for Doctor Cook), so with 1000 screaming fans Doc Peter had to change his tire with 500 of those fans shouting instructions about the best way to do it! After only 3-4 minute our nimble fingered Doc was hammering out again on the bike. Could the flat have happen at a better spot? I don’t so, with so many people and such crowd support Peter was a hero! The cheer team got on buses that took 65 mins to get to the wickedest hill on the double loop route. The bus ride was harrowing, on tiny gravel roads with 300 foot drops on each side and other busses coming the other way – our heart rates were higher than the cyclist’s! But we got to be loud obnoxious Canadians for a change – with our 2 big flags we barricaded the tour du France type fan supported climb. As our team mates road by we were happy to play bull fighter and “toro” them through the Canuck flag barricade. We missed the speedy Dr Derek and the crazy fast Dr Christine Walsh (man we had a lot of Doctors eh?) but we were more than happy to see the smiling pearly whites of every other team member coming up the hill. Back on the bus to watch the run. So the run goes out to Krumpendorf (5k) and back to the race site then into downtown Klagenfurt, through the outdoor pub and restaurant mews around the “pucking Dragon” (6k) and back to the race site and then repeat! We were able to see our teammates 5 times each on the run. It was fantastic to watch how peoples gait changes as they get tired but also to watch how their body language perks up when they see people they know! Dr Derek was a hurtin dude as he came through after the first lap – with his prosthetic like leg brace his ailing knee was just fine but his back was a mess, so our drug team was able to find him some advil on the route and on his third time by (30k point) he may not have been happy but he was solid! Chris Walsh was next, she stopped open her arms wide and said “yah only Around the Bay to go”. I think we all shut up and thought ooh yuk – bad imaging! But she was all smiles all day! B – who doesn’t like Brian, a true crowd pleaser, always smiling and if he wasn’t half black and half Asian you would have thought he was a Greek God! Ripped, fit, smiling and always positive – he motives people around him. He stuck to our 4 min run 2 walk strategy all day long – no deviations. Francesca – a swim survivor, a bike newby but a running fool! I had the “pleasure” of running with Francesca from 30k to about 33 k of the race, and barely kept up with her, she was totally ripping it up, and able to speak in full sentences while she was grinding me into the Klagenfurt ground. Her run was amazing and her finish inspiring. Always smiling and always pushing! Peter Cook – Peter got soaked – it poured with rain the last bit of the run. I am sure his shoes are still wet. It got incredibly dark with literally the only light at times from lightening! I had the very distinct pleasure of running Peter to within 500m of the finish line, at points running 60 seconds walking 60 seconds but never wavering, always feeling like we were lost in the rainy black forest (all the route volunteers had run for cover from the storm), but hearing “you are an Ironman” again and again. No one deserved hearing it more than our determined Doctor! So I am sure no one read this entire blog to the finish – let me know if you did (you win a PACE hat!). But safe to say June 29 2014 will be one of the proudest moments of my coaching career. As always those who seek motivation end up providing motivation to others! Thank you team for your motivation!